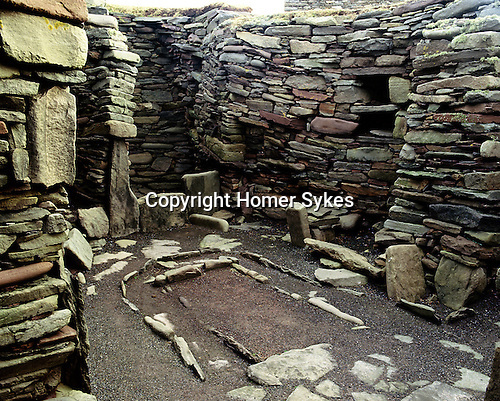 Jarlshof Bronze Age House, Sumburgh, Shetland, Scotland. Celtic Britain published by Orion. Jarlshof Bronze Age settlement was first settled by Neolithic man, and then Bronze Age and Iron Age people, also during the Viking occupation and intermittently up to the sixteenth centuary. Its a British Pompeii on the edge of the sea. The site was lost below a blanket of sand untill a storm in 1897 re exposed parts of the settlement.